Tuesday May 19th 1925 I sewed in forenoon. Went up to Hatties in afternoon. Emma is sewing for her. I had letter from Warner McCall and Charles Duncan wedding cards. After supper Ott drove out to Tiffen taking Fannie & me with him. After we came back I wrote Warner McCall and Lydia. Wednesday May 20th 1925 I sewed some in AM. Roe to town with Fannie before dinner. She took me to street car after dinner to go to Missionary meeting at Mrs McClintocks. I had letter from Mabel Mason. Wrote LeGrand a birthday letter. very warm. 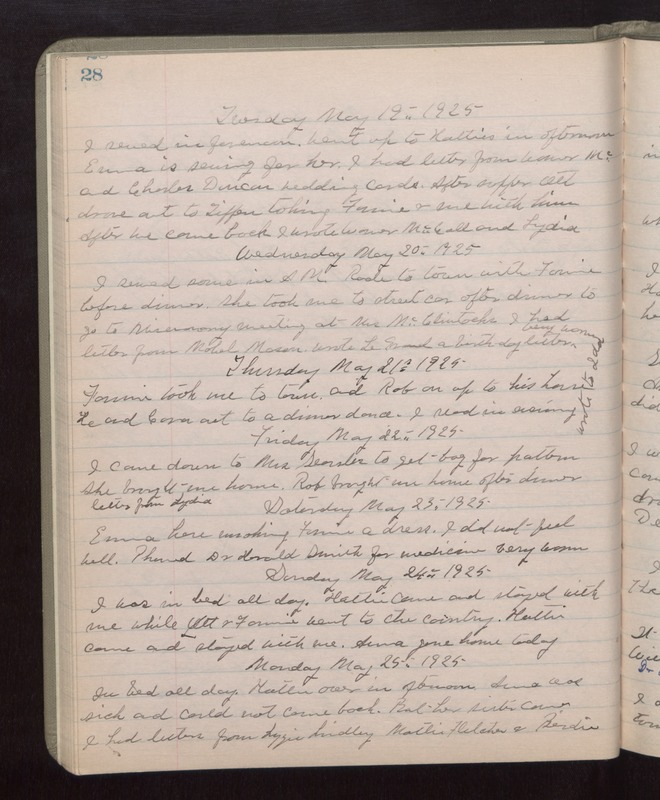 Thursday May 21st 1925 Fannie took me to town and Rob on up to his house. He and Cora out to a dinner dance. I read in evening. wrote to Ida. Friday May 22nd 1925 I came down to Mrs Searsler to get bag for pattern. She brought me home. Ron brought me home after dinner. Letter from Lydia. Saturday May 23rd 1925 Emma here making Fannie a dress. I did not feel well. Phones Dr Harold Smith for medicine. very warm. Sunday May 24th 1925 I was in bed all day. Hattie came and stayed with me while Ott & Fannie went to the country. Hattie came and stayed with me. Anna gone home today. Monday May 25th 1925 In bed all day. Hattie over in afternoon. Anna was sick and could not come back. But her sister came. I had letters from Lizzie Lindley, Mattie Fletcher & Birdie.